BARRIE, Ont. 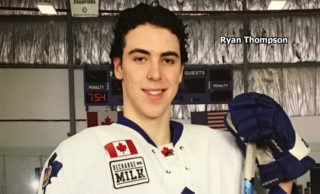 – Andrew Mangiapane scored the only goal in a shootout to give the Barrie Colts a 5-4 comeback victory Saturday night over the North Bay Battalion, handing the Troops a fourth straight Ontario Hockey League loss. Mangiapane scored two goals in regulation time, Kevin Labanc had one goal and two assists and Dylan Sadowy also scored for the Colts, who trailed 4-2 in the third period. Goaltender David Ovsjannikov faced 49 shots through overtime before a sellout crowd of 4,198. Barrie moved its won-lost-extended record to 25-16-1 for 51 points, first in the Central Division, one point ahead of the Niagara IceDogs, who hold a game in hand. The Colts played their third game in three nights after dropping two road games, falling 4-2 Thursday night to the Erie Otters and 6-4 Friday night to the Hamilton Bulldogs. 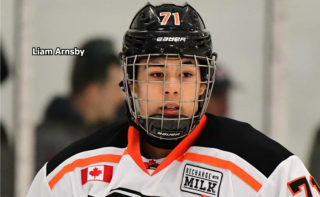 Mathew Santos scored two goals and added one assist for North Bay, which also got goals from Daniil Vertiy, on a penalty shot, and Mike Amadio. Goaltender Jake Smith made 30 saves through overtime for the Troops, 20-16-5 for 45 points, fourth in the division, one point behind the Mississauga Steelheads. The Battalion, making its first visit to Barrie since a 12-2 loss Jan. 2, has won three of five games against the Colts this season. 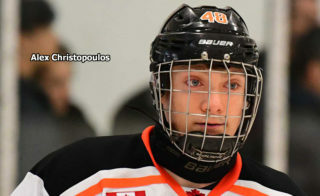 The Troops prevailed 7-3 at home Nov. 15, 5-2 at Barrie on Dec. 19 and 5-3 at home Jan. 3. Newcomer Sadowy started the Colts’ comeback when he drilled home a Roy Radke feed at 8:21 of the third period. Mangiapane tied it at 12:36, converting a Labanc pass from behind the net. The Troops, who had a power play for the first 1:31 of overtime with Sadowy off for high-sticking, just missed ending it when Ovsjannikov slid across to get his left pad on a Brett McKenzie shot off a two-on-one rush. At the other end, Greg DiTomaso missed connecting at the lip of the crease and Cordell James lost control of the puck alone in front of Smith. The teams traded chances in the final seconds, Ovsjannikov sprawling to deny Cam Dineen and Smith getting in front of a last-second shot off the left wing by Labanc. With the Colts going first in the shootout, Labanc was foiled by Smith and Mangiapane scored on a forehand deke before Sadowy missed. Ovsjannikov denied Amadio, Steve Harland and Kyle Wood. Barrie’s Julius Nattinen went off for crosschecking at 7:28 of the first period, and Justin Scott followed 23 seconds later, receiving a major for checking from behind, on Amadio, and a game misconduct. Santos capitalized on the two-man advantage when he tipped Wood’s drive from the top of the left-wing circle past Ovsjannikov at 8:08. Dineen had the second assist. Referee Darcy Burchell awarded Vertiy a penalty shot at 14:05 after Vertiy was hooked by Michael Webster while breaking in on Ovsjannikov. Vertiy beat the goaltender between the legs. Barclay Goodrow scored the Battalion’s previous goal on a penalty shot, against Erie’s Oscar Dansk in a 5-2 win at Brampton on Dec. 9, 2012. Goodrow also scored the last penalty-shot goal on the road, against Niagara’s Christopher Festarini in a 6-5 win Dec. 1, 2012. Mangiapane cut Barrie’s deficit at 16:53, backhanding a loose puck past a fallen Smith. Amadio struck shorthanded at 8:39 of the second period, taking a breakaway pass from Santos and beating Ovsjannikov low to the stick side. Amadio’s team-high 25th goal was his sixth shorthanded score, which leads the OHL. Labanc replied at 16:33, racing into Battalion territory with McKenzie in tow and beating Smith high to the glove side, but Santos struck again on the power play at 17:54 when he steered a Wood pass between Ovsjannikov’s pads. Dineen earned the second assist on Santos’s 14th goal. Dineen, Wood and Max Kislinger tested Ovsjannikov, while Kyle Potts fired a drive off the right post in the 10th minute. Mangiapane rang the puck off the right post from close range in the first minute. The Battalion hosts the Sudbury Wolves at 2 p.m. Sunday. BATTALION BULLETS: Amadio eclipsed Jeff Bateman for sole possession of seventh place on the franchise’s all-time points list. In 236 games, Amadio has 67 goals and 117 assists for 184 points. He has nine career shorthanded goals, tied with Wojtek Wolski for second place in franchise history … McKenzie saw the end of a six-game points streak in which he had four goals and two assists. 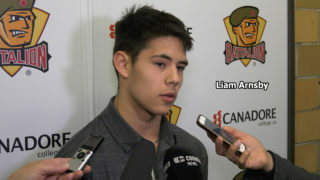 Harland also had a six-game points streak ended. He had one goal and five assists in the run … The Battalion was 2-for-5 on the power play. Barrie went 0-for-3 … Brett Hargrave opened the game at centre but moved to the blue line as the Troops dressed five defencemen. 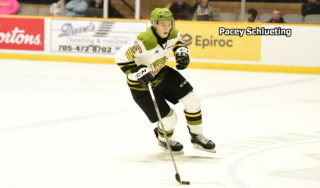 Hargrave turned 20 and Jacob Ball 17 … The Battalion was without Zach Shankar, Riley Bruce and David Sherman … Barrie acquired left winger Sadowy, right winger Keigan Goetz and defenceman DiTomaso from the Saginaw Spirit and Sault Ste. Marie Greyhounds before the trade deadline Monday, giving up 13 OHL Priority Selection picks, two of them conditional, and defenceman Rocky Kaura … Colts goaltender Mackenzie Blackwood has been suspended five games for firing the puck into the stands after surrendering a goal at Hamilton. 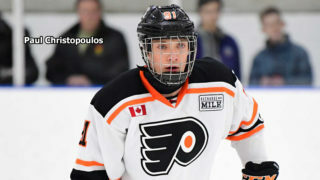 He drew a game misconduct … Christian Propp, a 16-year-old who has seen brief action in two games, backed up Ovsjannikov.